Engaging centers or seatwork are invaluable to a teacher. The students enjoy them and they serve as excellent reinforcement for skills already taught in the classroom. This file contains two activities for use as centers or seatwork. 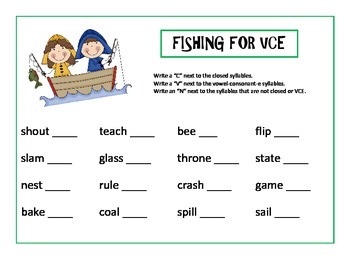 Only closed and vowel-consonant-e syllables are used in these activities. 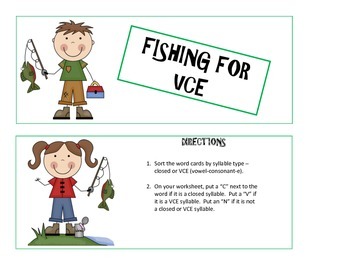 "Fishing for VCE" - students practice recognizing closed and VCE syllables. 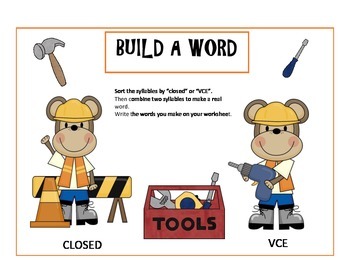 "Build A Word" - students sort syllables by closed and vce. They then combine the syllables to make real words. 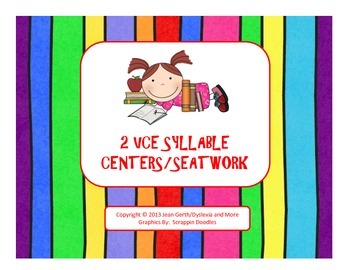 Also see "Closed Syllable Centers/Seatwork".